The following reposted article by Brian DeGregory is from a Facebook post that my friend and fellow yoga teacher collegue, Jane Green Battisson posted. Jane, thank you for braving the critical Facebook world with this bold post as when posts like this show up, many recede and or get defensive, [because its the truth]. This is a very good read about how yoga is being misinterpreted today– through social media and marketing. 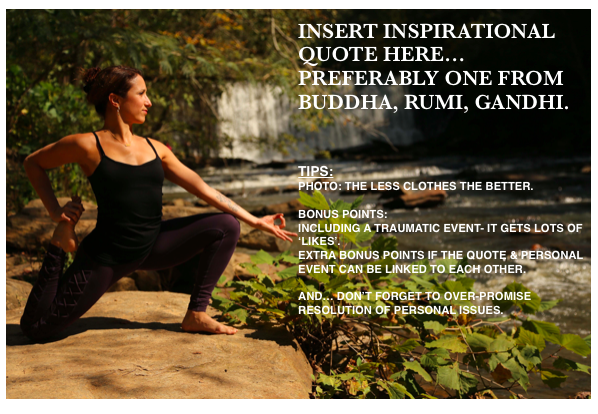 I’m sure it will trigger the ones who do are marketing themselves in this way as we’ve all seen many defensive responses from yoga teachers who justify why they self-promote through displaying themselves doing challenging postures. Yes, everyone is in a different place in their practice, BUT, there’s no denying this is happening– the dismantling of tradition with few who are resourcing back to the original teachings. In the past 10 yrs, the commercialization of yoga has gotten out of control and become the new norm for how yoga is shared– from being purely physical and accented with elements of philosophy. With the explosion of teacher training programs, new teachers leave with minimal guidance and great influence from their teachers/yoga community of how they shall navigate. The typical formula: graduate > teach as much as one can and wherever > market on social media- most typical displaying an intense asana with a spiritual quote. Now, I can’t blame those who do this too much as they learned it from someone- their teachers, online, through magazines. All of this gives the impression that this is what yoga is and how it is being shared is the norm. I began teaching yoga in the late 1990’s. Back then, the resources that exist today for self-promotion and marketing were non-existent. I also was a karma yogi (work-trade), and part of my responsibilities were distributing information for studio events at local cafes- back when it was common to have an event community board. Yes, it was a completely different time, but… what limited marketing resources encouraged teachers and studios to do was to be authentic and showcase their teaching skills and current level of experience– and it was never based off their physical ability. It’s our job as veteran teachers to be an example. How? Start by practicing yoga and meditation. What I mean by this is, buck up to the discipline of making time for it; for yourself. Practicing in a studio is not the same thing. Many yoga teachers are in the habit of ‘doing their yoga practice’ in a studio. Often times they are taking from inexperienced teachers who themselves do not have the self-discipline of sva-sadhana (self/personal practice) and lead classes heavy on physical postures (asana) and seldom with some theme that is announced at the beginning and quickly forgotten about once the posturing begins. I can always tell when teachers don’t practice. They tend to be the ones who teach a ton of ‘yoga’ classes, spend time in their car racing from studio to studio. Many do so to make a living. I get this, but lets get real… The yoga industry is worth a billion dollars. There’s plenty of work to do and room to earn a decent living without exploiting one’s self or the ancient philosophical traditions that have survived over 5,000 years. 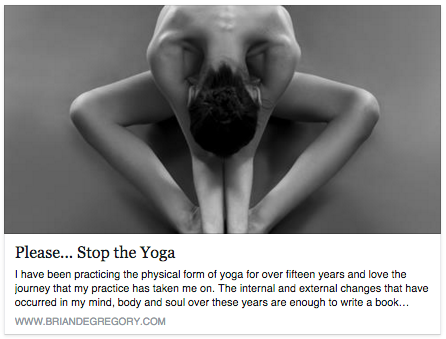 Yoga doesn’t happen in a studio; it begins with the individual & is expressed in our actions. And if we’re practicing, the effects of positive expansiveness will gleam in all aspects of our lives. Way more fulfilling for our hearts than a selfie promo advertising our physical skills. That’s the outside anyways. The path is within. Do the work of creating sva-sadhana and supplement practice with studio classes. Yes- I said that out loud. Sorry, studio owners. Its true. Do this for yourself and for those you influence so that everything that we love and respect about the yoga traditions will carry forward. Keep the torch lit! I’d love to hear your thoughts on this! Leave your comments on my blog and I’m sure that Mr. DeGregory would love to hear your thoughts as well. If you read this and decide to comment on my feed or the author’s, please do so respectfully. This is one of many conversations that we can all have in a positive way.